Happy New Year! I hope you had a wonderful Christmas break and are feeling rested for the new year ahead. As is only to be expected over Christmas, I’ve been eating a lot of indulgent food and having a few too many large helpings of Bailey’s on ice. I had a break from cooking while visiting family, but am excited to share more recipes with you in 2016. As I’m sure it has for many people, my January has got off to a frugal start, especially as I’m saving to get married this year. I’m attempting to take packed lunch into work every day this month and trying to resist the temptation of eating out (though I’m doubtful on that front). This evening I conjured up this store-cupboard supper of aubergine and broad bean curry, which I used with leftover ingredients in the fridge and cupboards. I’m really pleasantly surprised by the end result; it was delicious! This is a low-fat vegan curry, using lighter coconut milk. The sweetness of the coconut milk is balanced out by earthy tomatoes, forming a rich, moreish sauce. The texture of the soft aubergine slices are contrasted nicely with the firm broad beans. I just happened to have a can of broad beans hanging around, but you could easily add an alternative pulse like butter beans, or perhaps some green beans, to retain the lovely green colour. Serve this with brown rice and a dollop of mango chutney if you fancy and you’re in for a tasty yet healthy meal. And, it’ll be on the table within 45 minutes, so it’s achievable for a weeknight. Peel and chop each onion in half, then finely slice and dice them. Pour the oil into a wok or large frying pan and put on a medium heat. While the oil is heating through, chop off the ends of the aubergine and slice in half longways. Slice each half into fairly thin half moon pieces, around 3cm, so they’re thick enough to soak up the lovely spices, but not so thick that they’ll take a lifetime to soften. Add the onion and aubergine to the pan and cook for around 10 minutes, or until the aubergine pieces begin to turn translucent. Stir frequently. Meanwhile, put some water on to boil in a saucepan, ready to add your brown rice. I use two mugs of water to one mug of rice for two portions. When the aubergine looks translucent, stir in the garlic cloves and balti paste. Pour in the chopped tomatoes, coconut milk and 100ml of water and bring to the boil, stirring everything in together. Add the ginger and coriander and simmer for 15 minutes, stirring occasionally. When the water for the rice is boiling, pour in the rice, stir well and simmer for 25 minutes. When the curry has been simmering for 15 minutes, tip in the broad beans and mix in with the curry. Continue simmering for a further 10 minutes. When the curry sauce has reached a deep red colour and has thickened up, take the pan off the heat and season well. Serve alongside the brown rice. 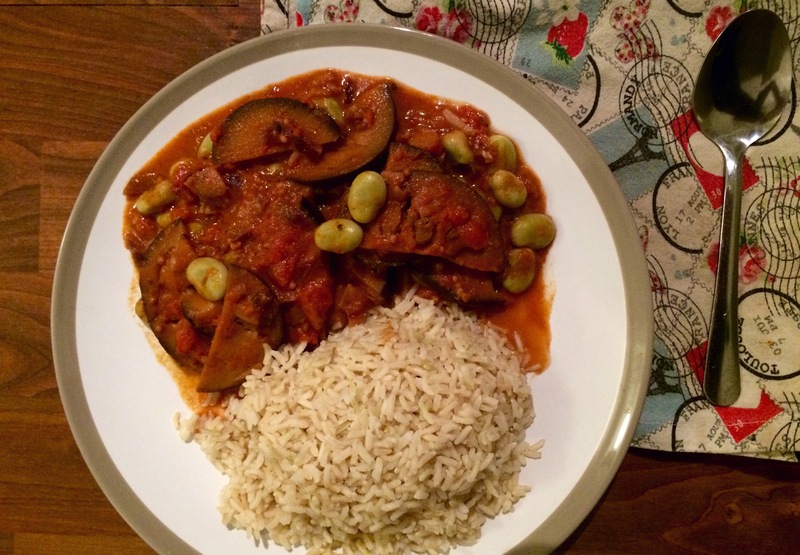 This recipe was inspired by Nigel Slater’s aubergine curry (Guardian website). It’s a new year so let’s celebrate by eating paneer. Paneer is a firm, milky Indian cheese. It’s a really satisfying ingredient to use in vegetarian curries because of its robust texture and the way it squeaks when you chew it – similarly to the Cypriot halloumi. It’s an absolute treat. I first tried saag paneer (curry with spinach and cheese) at a curry house, Akash, in Leicester at university back in 2006. They put on an incredibly bargainous student meal deal for £6 which included poppadums, onion bhajis, a curry, rice and naan, and a bowl of ice cream. It was ludicrous! But the food was surprisingly good, and I was amazed by this new discovery of cheese… in a curry. It added a new dimension to going for a curry as a vegetarian. Traditional curry houses usually list paneer curries as side dishes to accompany meat, but they very much stand in their own right as the main event and staff don’t usually bat an eyelid if you ask for it as a main. More contemporary restaurants, like Tayabbs in Whitechapel, and Dishoom, who have a few restaurants across London, offer innovative and exciting paneer main dishes that are well worth a try. 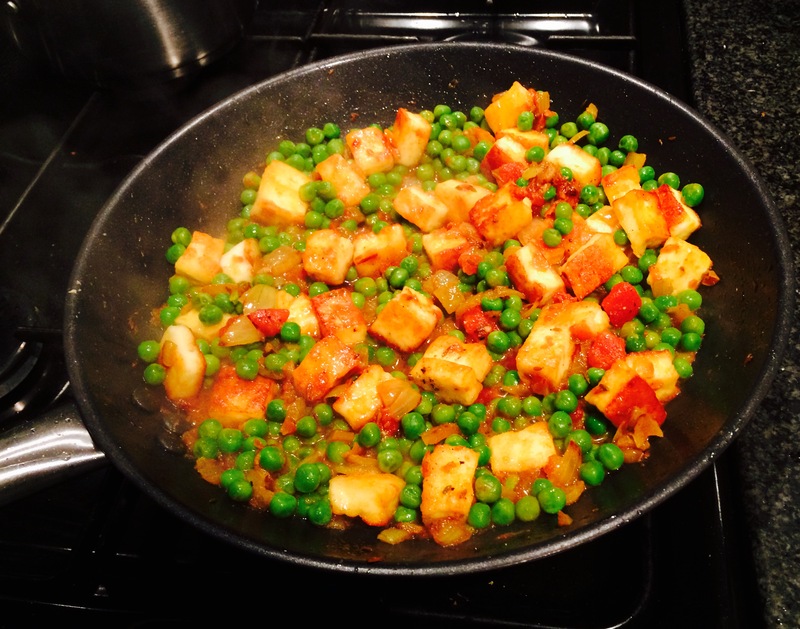 I could talk more about my love of paneer, but instead, let’s focus on the matar paneer I made on New Year’s Day 2015. This recipe is taken from Rick Stein’s cookbook, Coast to Coast, inspired by his travels across the world. The curries in this book are a taster of his more recent, exclusively curry-based cookbook, India. I watched the TV series that accompanies this book as Stein travelled around India in search of the perfect curry. I could sit and listen to him all day: his passion for food and flavours is so inspiring. I’d recommend this book for meat eaters and veggies alike as it’s got such a diverse and unusual selection of curries. As it was New Year’s Day and I’ve been ill, I’ve adapted Rick’s recipe slightly by substituting a couple of the fresh ingredients for supplies I had in the store cupboard. This dish is really easy to make and only takes 30-40 minutes. The combination of pungent spices work wonderfully together and will be sure to get the tummies of your diners rumbling. And the vibrancy of the green peas, the red tomatoes and the golden paneer pieces make it very visually tempting. 1. Chop the paneer into equally sized cubes, around 2-4cm, so they cook evenly. 2. Heat half of the sunflower oil in a large, shallow frying pan on a medium heat. Add the paneer and fry gently for 5-10 minutes, turning frequently, until lightly golden on all sides. Take them off the heat and place on kitchen roll on a plate. 3. On a low to medium heat, pour the remaining oil into the pan and add the onion and spices. Stir in well and fry gently for 5 minutes, or until the onion has softened. 4. Add the tomatoes, peas, salt and two tablespoons of water and simmer for five minutes. 5. Stir in the paneer and the black pepper, and cook gently for a further five minutes. 6. Season to taste and serve with basmati rice and mini poppadums (the ones from Marks and Spencer are tasty and only cost £1). May your 2015 be as colourful and satisfying as this dish was to prepare and eat.